I’ve been here more then a year, so bit by bit I am getting used to everything. Last year for example, I thought that in Argentina fruits (and vegetables) were scarce. You can always buy (one or 2 types) of apples, one type or pears, and oranges, but besides that there is not much else. We are major fruit and vegetable consumers, but it turns out that here in the stores you only find the ‘fruits of the season’. Which is -at times- not much. For quite a long time we had to do with apples, pears, mandarins, oranges, bananas, kiwi, and that’s about it. No melon, pineapple, mango, passion fruit… Quite boring if you ask me. It’s about the same with vegetables : all winter we have been eating cauliflower, tomatoes, beans and pumpkin. After I had lived through every season here, I realized there was only one thing to do: eat as much as possible of the vegetables and fruits of the season (until you are really tired of them) and then you’re ready and happy to move on the next season. That’s what we do now anyway: a whole year it was impossible to find asparagus, but then there they are, and for about a month we have been eating nothing but asparagus, à la Flamande, with garlic, soup etc… until my kids say “Please mom!!! Can you make something else??”. So now a new season has started. It is definitely my favorite. 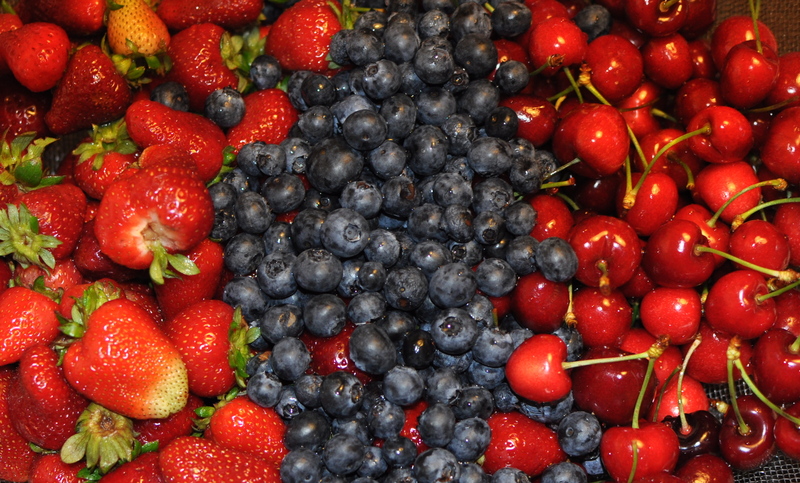 It’s the season of strawberries, blueberries, plums, cherries, peaches and apricots. But also of melon and pineapple. We just can’t get enough of that. I feel as if this season can’t last long enough so every day I buy kilos and kilos of fruit. And they are absolutely delicious! We attack them as if we didn’t have any food in days, and in no time it’s time to get some more. And -compared to Belgian prices- really cheap! There we pay astronomical prices for the fruits that are brought in from all over the world; and even the local strawberries (still somewhat better then the Argentine ones, although you don’t hear me complain) are extremely expensive (about 10 times as much as here). Please, oh please! Don’t let this season end, ever!!! N.B. The shopkeeper told me that they only sell cherries for about 2 weeks so enjoy as long as you can! I just found your blog and I’m happy with what I see. I am argentino. And what you write here is quite fair and truthful. Yeah, me too, I hate waiting lines. I must tell you anyway that sometimes, someone may want to skip but he will be rapidly corrected with a “qué hacés pedazo de boludo” or something similar. We are so accustomed to our problems that only when someone from outside comes and talks we see the difference. At least my head is open to listen to your critics without going rabble rabble about my argentinidad, and that Dios es argentino, and all the funny things that some do when someone critics our beloved/hated country. I have read many of your posts but I still can’t figure out where are you from. About the problem you see with vegetables and fruits it is something I miss too because in the past it was easier to get any fruit all year long. The crisis… a kilo of anything from off season goes up to 30 pesos so who’s gonna buy it anyway. Why would any verdulería try to sell it. As a foreigner with different thoughts, what do you think we should do to make this a better place for us and, of course, for you? I’m open to eny comment, no matter what you say 😛 The truth is often hard. After one year and a half I still love Argentina, and no it isn’t perfect, but no country is! Some things could be done better, but then on the other hand, i like a bit of chaos. Where I come from, all is so well organized and everything is so full of rules that -to me- it is just too much. El chino Sen, se cayó gratis! I live in the USA. I am Argentinean and just came back from Argentina. When I lived there I was able to find non-seasonal fruits. Now, during my last trip, I also observed that you can also find non- seasonal fruits. As a matter of fact, my mother bought grapes (horrible ones, of course). I do not know how it is in Belgium, but here (in the USA) the same thing happens. The best fruits are the seasonal ones. Sometime it is “very difficult or impossible” to find fruits that are not from the season. And if you find them, they are very expensive and, in general, not good. I have been always advised to buy the “fruits of the season”. They are cheaper and better quality. I agree, seasonal fruits/vegetables are the best, but I like being able to eat whatever I want whenever I want it. Make strawberry jam in winter, eat asparagus whenever it comes into my head, etc. I just learned that I will have to do without my favorite Thai dish as lemongrass isn’t available in winter. But then I must admit, fruits are (generally) a lot better here then in Belgium. Especially the oranges- the juice is so much lighter!